Improving ankle mobility in freestyle, backstroke, and the butterfly is often vexing for both swimmers and coaches. Some swimmers appear naturally blessed with mobile ankles. Others work madly to force plantar flexion (toes pointed down) but make little progress. Although plantar flexion and dorsiflexion (toes pointed up) are both needed for dynamic ankle mobility in the water, plantar flexion is the more common limitation in the water for most swimmers. Excess drag due to greater frontal exposure. Ankles chronically pointed upward (like a letter “L”) act like an anchor behind the swimmer. Less efficient structures such as the knees will compensate if the ankles aren’t working. Ankles are important for balance in the water, just as on land. Ankle immobility results in leakages of energy created in the hips. A great toe point…but is it safe to copy? In full disclosure, as someone who works frequently with triathletes and masters swimmers, my own coaching results in training ankle swimming flexibility were originally not good! However, these athletes provided me with vivid models of the physical restrictions that prevent efficient kicking. It was not until treating ankle swimming flexibility as an expression of full body mechanics that I began to see greater progress in athletes. Let’s review the main lower leg muscles responsible for plantar flexion. The gastrocnemius and the soleus (collectively the calf) are often overlooked in efforts to improve plantar flexion. We’ll offer strategies to address these muscles in a follow-up post, but know that improving plantar flexion safely involves more than forcing the toes to point through passive shin stretching. 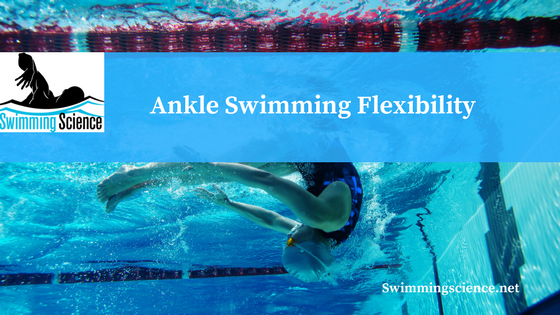 However, before exploring improvement strategies, we must understand what prevents swimmers from having ankle swimming flexibility to begin with, which leads us to the latter three items on the list above. The tibialis posterior, flexor halluces posterior, and flexor digitorium longus are interconnected via a meridian of fascia called the Deep Front Line, as termed by manual therapist Thomas Myers (author of Anatomy Trains). Fascia overlays muscles such that movement or restriction in any single muscle affects other muscles within the same meridian. Further up the Deep Front Line, key links include the popleitus, ilioposas, diaphragm, and scalenes (lateral neck muscles). Discerning coaches are sure to recognize these all as common problem areas, especially in older swimmers. The popleitus, located behind the knee, flexes the knee and internally rotates the femur (thigh). The iliopsoas, a group of hip flexors, often develops chronic stiffness via postural imbalances such as Janda’s lower crossed syndrome and weakness in the surrounding core musculature. Both the diaphragm and scalenes are implicated via faulty respiration. Stiffness in the above listed lower leg muscles contributes to excessive foot pronation. Dorsiflexion and pronation via stiff calves, tibialis posterior, flexor hallucis posterior, and flexor digitorium longus. Toes pointed up and out are great for breast…not so great for everything else! Stiff iliopsoas via anterior chain dominance. Unresponsive ankles often reflect predictable patterns of limitation elsewhere in the body. When a swimmer kicks with poor ankle swimming flexibility, excessive knee flexion, and insufficient or poorly timed hip drive in free, back, and fly, the kick is often a symptom of global limitations. As we’ll discuss in the follow-up post, corrective strategies should not only address the ankles themselves, but also a provide dose of posterior chain activation from head to toe (the posterior chain…we’ve heard that before!). Although our main focus will be on the ankles themselves, recall from that restrictions elsewhere in the body can contribute to ankle limitations, particularly with masters swimmers and triathletes. Soft tissue work, dynamic mobility, static stretching, and fin assisted kicking all play a role in improving ankle swimming flexibility. Soft tissue work – Think of soft tissue work as greasing the wheels for subsequent exercise interventions to take hold. Combine soft tissue work with exercise for the greatest improvements. Special considerations regarding soft tissue work: The lower leg houses many key nerves but offers less superficial protection than fleshier areas of the body. Do-it-yourself implements like balls and rollers usually don’t penetrate deep enough to cause problems, but stay away from bone structures such as the fibular head, over which the common peroneal nerve crosses. The common peroneal nerve is a branch of the sciatic nerve, which originates in the lower back and runs down the back of the leg before branching off at the fibular head. How we train the core and posterior chain can directly affect the ankles. Static stretches – Static stretching is perhaps the most familiar dryland tool to improve ankle mobility. In my experience, static stretches are effective to gain a few extra degrees in a swimmer who already has good mobility. If a swimmer has a range of motion deficit, you probably need more than static stretching because the lack of mobility could be a sign of global issues, as we discussed in the first installment. Additionally, there are delicate structures in and around the ankle that inherently limit the plantar flexion of certain individuals. If your dryland program includes ballistic movements such as running and jumping, realize that you must balance ankle mobility with the athlete’s ability to stabilize on land. Many swimmers cringe at the sight of The Rack. While I wouldn’t consider The Rack the panacea for ankle limitations, I wouldn’t dismiss it either. When used correctly on athletes who already possess an acceptable range of motion, The Rack can add a few degrees of plantar flexion. However, spending a significant time with The Rack is generally a waste of time for a triathlete or masters swimmer whose tight ankles are a product of global mobility restrictions. As with The Rack, this method can be appropriate as “icing on the cake” but I’d be cautious if the swimmer has global mobility restrictions. Assist with a towel or pillow under the knees if the shin angle is too extreme. Gradually reduce the height of the towel or pillow as flexibility improves. One overlooked point in doing this stretch is the direction of the feet. It is easy to cheat this stretch by “sickling” the feet inward. via sickling results in inefficient energy transfer both up and down the leg. While these pictures below display use of a theraband, you can also use a rope or your own hand for different types of resistance or assistance. Resisted: Make sure with this exercise that the athlete does not cheat by curling the toes around the band. Assisted: Here the resistance is against dorsiflexion, but plantar flexion is assisted. Ankle eversion is critical for breaststroke. Those with limited plantar flexion often struggle with eversion as well. Eversion improvements are valuable particularly for freestyle oriented IM-ers with ankle deficits, particularly if you aren’t able to fully address breaststroke specific hip rotation. If you train eversion, don’t neglect the opposite direction (inversion). Use long and soft fins for teaching. Certainly, we have many simultaneous goals with kick training, from tempo, timing, power, and upper/lower body coordination. Coaches have many different preferences for their squads and there is no single “best” fin. However, when the purpose of a set is to train ankle mobility, long and soft fins best replicate the pattern of energy transfer through the leg. Don’t rely on the first two moldy pieces of rubber you pull from the lost-and-found bin! Improving ankle performance in kicking requires a blend of soft tissue work, flexibility training, dynamic mobility, and judicious use of fins. As with any aspect of training, our role as coaches is to find the right blend for each athlete. In the future, we’ll explore the role of the ankles in starts, turns, and on dryland.